Did you know that damaged trees can become diseased and eventually die? 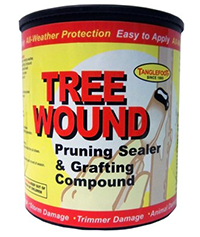 Don't leave injured trees to heal on their own, use Tanglefoot® Tree Wound Pruning Sealer & Grafting Compound to help repair harm caused by pruning, animals, insects and storms. This water-proof, ready-to-use formula protects your trees through every season. Material should retain a thick, paste consistency. If it becomes too thick and heavy, add a small amount of water and mix thoroughly.